Todd Leonard, senior pastor of the Glendale City Church in Glendale, California, has helped to organize a lecture series to hear how other faiths perceive the new world. In this interview, he tells about the Imam, the Father and the Rabbi who are presenting this series and what Adventists can learn from people of other religions. Question: The Glendale City Church has invited Muslim, Jewish and Christian clergy to present lectures in a series called Abrahamic Faiths' Hopes for Salvation. The presentations will be given throughout the month of October, and on October 6, Imam Sayed Moustafa al-Qazwini of the Islamic Educational Center Orange County spoke at Glendale City Church. How did it go? What did the Imam say? Answer: Imam al-Qazwini was such a wonderful and engaging person. The audience delighted in his wit and wisdom. His presentation was entitled “Why We Need a Universal Savior.” He talked about Muslims’ hope in the return of Jesus (Muslims believe that a descendant of the prophet Mohammed will accompany Jesus) and the importance God’s faithful followers to actively work to become people of integrity who work for peace and justice for all peoples as we prepare for Jesus’ return. Following his presentation, he graciously allowed the audience to ask questions about the second coming or any other subject related to Islam and interfaith relations. The various questions led him to share his heart’s passion to see an end to Islamic theocracies in the Middle East; his conviction that violence never solves anything; his belief that people of faith, working together, can alleviate poverty in our communities; and his lack of interest in converting anyone to Islam — he would rather people of faith commit fully to the leader of their own traditions: Jews to Moses, Christians to Jesus and Muslims to Mohammed. Did you have a large audience in attendance? What feedback about the series have you heard so far? Are people coming from beyond the bounds of your own congregation? As we advertised this event to our local community, there was some concern expressed by conservative Christians that we were doing something “spiritually dangerous” by inviting other faith traditions to speak to a Christian congregation. People suggested that there was no truth to be gained from someone from a Jewish or Muslim perspective, especially since these religions don’t see Jesus as possessing divinity nor providing salvation to the human race. But for those who attended on Saturday, the feedback was overwhelmingly positive. The feeling that we had experienced something sacred was mentioned a number of times. We probably had close to 175 people in attendance, roughly 25 more than usual. We had at least 20 people in attendance who had never attended before, including a number of people of Jewish, Muslim and non-Adventist Christian backgrounds. On October 13, Father Vazken Movsesian of the Western Diocese of the Armenian Church is scheduled to speak. What instructions have you given him about the topic? Metropolitan Los Angeles has the largest concentration of residents of Armenian descent in the Western world, with over 100,000 in Glendale alone. Their culture and faith have significant influence in our city. Armenia has a compelling history that is passionately carried by its descendants. Armenian people take pride in being the first nation in world history to be called “Christian” and Armenian Apostolic faith practice today is still deeply rooted in their ancient traditions. But they are also marked by the genocide of 1915 where the Ottoman Empire slaughtered over 1.5 million Armenians. Father Movsesian has been on a mission to lead people of Armenian heritage, rather than continuing to carry bitterness in their hearts for the suffering of their ancestors, to become people of empathy who rally to protect and support people who are suffering at the hands of political oppression and violence. He will be talking about his organization’s recent work to support Syrian, Iraqi and Afghani refugees as well as their local work to help immigrant and homeless families. He believes that New World living means using ancient faith to redeem recent suffering to bring about healing and reconciliation to people today. Later, Rabbi Susan S. Conforti, a pastoral counselor, will take the pulpit. What differing view and alternative insights do you anticipate she will bring to the series? Rabbi Conforti has deep convictions, rooted in the Jewish concept of Tikkun Olam, or Repairing the World, that God’s people must be engaged in the work of ecological protection and restoration. More than perhaps any other presenter, she is convinced that the prophecies from the Torah speak to this current earth being transformed rather than being destroyed. Out of that conviction, she has been actively involved with an organization that is trying to move the United States away from factory farming to more ecologically sustainable and humane farming practices, along with encouraging Americans to shift from a meat-based diet towards a plant-based one. Why did you want to hold this series? What benefit does it bring to the Glendale City Church congregation? Johnny Ramirez-Johnson, our associate pastor and professor at Fuller Theological Seminary, has worked hard to put this series together. We both feel it benefits our congregation and our community. To creatively and compellingly dive into our Adventist belief in new heaven and new earth out of the conviction that God calls us to start practicing a new earth economy now as we await the culmination of the divine healing of the cosmos. To awaken ourselves to our family ties by learning from those with whom we share ancient roots and have much in common, but, for whatever reason, have chosen to remain distant from. We believe that taking small steps towards friendship with others is part of living out a new earth economy. Why did you focus on the Muslim, Jewish and Christian traditions -- the faiths that began with Abraham in the Bible -- specifically? Why not include other faith traditions as well? We knew that for many in our local Adventist and conservative Christian congregations that including any religions outside Christianity would raise concern among many. I personally would love to plan future opportunities where we could learn more from people from Hinduism, Buddhism, B’ahai and other traditions. But that is a conversation that our congregation’s leaders will have in the months to come as we reflect upon this event and determine if and how we would plan for future events like this. Do you have further plans to work with local members of other faiths? Our congregation already has healthy relationships with a number of Christian and Jewish congregations in our city and cooperate together to: support people in poverty; bring our city together each year for a prayer breakfast; and to create opportunities for cross-cultural dialogue. This event is another step in our work to build new relationships. What similarities do you see between the Abrahamic faith traditions? What differences? There seems to be an inherent optimism in God and God’s people to work together towards a new world. While there is, obviously, much pessimism about our current political situation and about religion’s decline, each presenter continues to believe that a better day is coming and that good people from all walks of life will be active in bringing this about in harmony with God’s promises. The best expression of each faith tradition, they believe, is where God and God’s people bring life, hope, love and justice into places of death, despair, hatred and suffering. Do you believe it is important for Adventists to work and dialogue with clergy of other faiths? Why? I believe it is absolutely crucial for a number of reasons. 1) I know that many Adventists feel that we suffer prejudice from other Christian traditions because of our unique beliefs or our repeated evangelism efforts that appear hostile. I know firsthand that my time spent with clergy and congregational leaders has broken down a lot of stereotypes about Adventists and has resulted in new partnerships of trust and goodwill. 2) I have learned so much from people from other faith traditions. They inform and enrich my Adventist Christianity. And I believe my faith rubs off on them a little bit, too. 3) Many of the challenges that our society faces today are so far beyond what any one congregation or denomination can do on their own. On the large justice and environmental issues that we face today, we must join hands with others if we want to do God’s work in these areas. That doesn’t mean that we give up the unique beliefs and practices of Adventism, but where we share similar convictions with others, we need to get on the same team. Have you planned similar series in the past? Do you have plans for others in the future? We have had ecumenical gatherings for specific purposes in the past: prayer vigils, community organization and more. But I hope this specific type of gathering that seeks greater understanding between faith groups becomes an annual focus for our congregation. Would you have advice for other churches considering planning something similar? For those planning something similar, spend time with your congregation to sense their comfort level to gatherings like this. Maybe they would be more comfortable starting with bringing in various Christian denominational leaders to present on a specific topic. Make sure you’re clear that you’re not trying to “evangelize” people away from orthodox Adventism, but rather are seeking to create a space for friendship and mutual learning. And talk about the benefit of people in your community beginning to recognize your congregation that respects people of other faiths rather than being afraid of or, worse, condemning other religious groups. For spiritual seekers today, seeing a posture of friendship and openness is much more attractive than hearing condemnatory language about what’s wrong with everyone else. 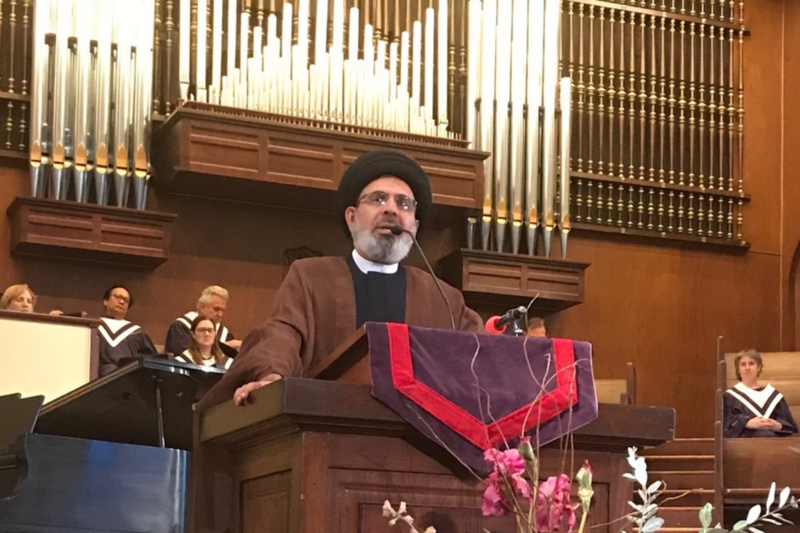 Photo of Imam Sayed Moustafa al-Qazwini of the Islamic Educational Center Orange County spoke at Glendale City Church on October 6, 2018, courtesy of Todd Leonard.